Our law firm’s pledge is to provide excellent service in the areas of personal injury law, real estate law and criminal law. In today’s competitive and complicated legal environment, you must have an attorney who is experienced, knowledgeable, and capable. With the understanding that each and every client is important, both Brad and his support staff are accessible, responsive, and resourceful. We serve clients in Lowell, Chelmsford, Lawrence, Andover and surrounding areas of Massachusetts, as well as the state of New Hampshire. 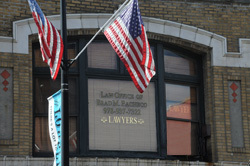 Our mission at the Law Office of Brad M Pacheco, LLC is to provide the best legal services possible to each of our clients. Communication is an extremely important factor in any attorney-client relationship. We keep in constant contact with our clients and make ourselves available so they stay informed about the status of their case. This is the key to a successful law practice and keeping clients satisfied at all times. We work tirelessly to ensure the best possible outcome is secured for all of our clients. We are currently accepting new clients and would be happy to discuss your legal matter with you. If we may be of any assistance to you or a family member or friend, please feel free to contact us by phone, e-mail or through this website. We offer FREE and confidential 30 minute consultations to prospective clients. In the event you are unable to visit the office, Brad and/or a member of his staff will visit with you at your home, place of work or accommodate another convenient meeting place of choice.